We advise asset managers on the impact regulatory, legislative and reimbursement changes can have on healthcare services companies, life sciences and biotech companies through our affiliate Marwood Group Research LLC, a FINRA-registered broker-dealer and state-registered investment adviser. 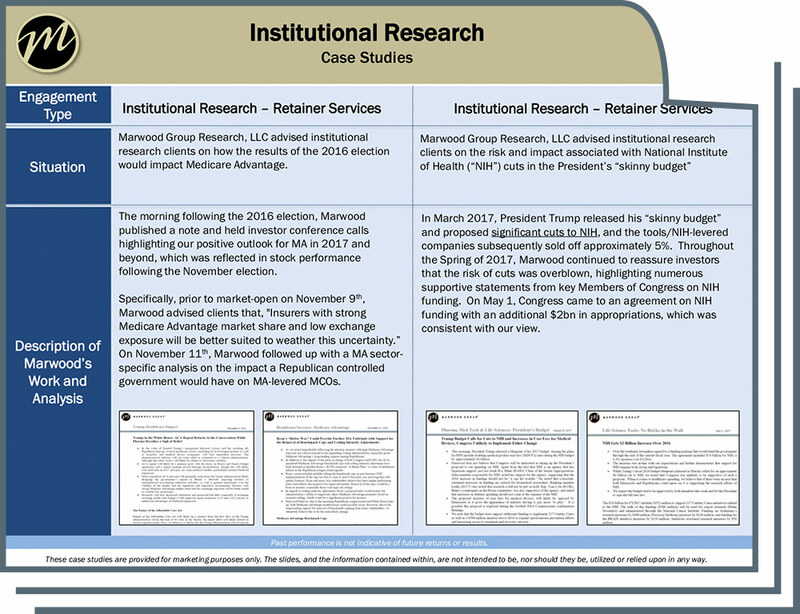 Marwood Group Research LLC forecasts, analyzes and tracks investment catalysts resulting from regulatory, reimbursement and legislative actions taken on the national or state level. Marwood Group Research LLC works exclusively with institutional investors. Marwood Group Research LLC provides clients with a concierge approach to independent research and access to regularly published research notes and client-only events and conference calls.